Cell culture medium with ground bone from chickens reared in the presence of OTC (OTC-CCM) resulted significantly cytotoxic at every incubation time regardless of the bone concentration while cell culture medium with ground bone from chickens reared without OTC (BIO-CCM) resulted significantly cytotoxic only after 72h of incubation. HPLC-ESI/QqToF assay ruled out the possible presence of OTC main derivatives possibly released by bone within culture medium until 1 μg/mL. Keywords: Antibiotic abuse, Oxytetracycline, Protein complex, Cytotoxic effect, Pro-inflammatory effect, K562 cells. © 2018 Di Cerbo et al. Some studies reveal that the widespread antibiotic use in agriculture and aquaculture might contribute to the development of resistance to antibiotics commonly used in human medicine [1Tang KL, Caffrey NP, Nóbrega DB, et al. Restricting the use of antibiotics in food-producing animals and its associations with antibiotic resistance in food-producing animals and human beings: A systematic review and meta-analysis. Lancet Planet Health 2017; 1(8): e316-27. [http://dx.doi.org/10.1016/S2542-5196(17)30141-9] [PMID: 29387833] ]. This issue becomes important particularly in zootechny due to its accumulation in animal feed and food with potential chronic consequences deriving from its ingestion to the species fed with these foods [2Palmieri B, Di Cerbo A, Laurino C. Antibiotic treatments in zootechnology and effects induced on the food chain of domestic species and, comparatively, the human specie. Nutr Hosp 2014; 29(6): 1427-33. [PMID: 24972484] ]. Nowadays, antimicrobials use represents a serious concern particularly in two correlated fields i.e. medical and agricultural [2Palmieri B, Di Cerbo A, Laurino C. Antibiotic treatments in zootechnology and effects induced on the food chain of domestic species and, comparatively, the human specie. Nutr Hosp 2014; 29(6): 1427-33. [PMID: 24972484] -5Witte W. Medical consequences of antibiotic use in agriculture. Science 1998; 279(5353): 996-7. [http://dx.doi.org/10.1126/science.279.5353.996] [PMID: 9490487] ]. In poultry, for instance, antibiotics are used to promote growth and to treat, control, and prevent overcrowding diseases [2Palmieri B, Di Cerbo A, Laurino C. Antibiotic treatments in zootechnology and effects induced on the food chain of domestic species and, comparatively, the human specie. Nutr Hosp 2014; 29(6): 1427-33. [PMID: 24972484] , 6Di Cerbo A, Palatucci AT, Rubino V, et al. Toxicological implications and inflammatory response in human lymphocytes challenged with oxytetracycline. J Biochem Mol Toxicol 2016; 30(4): 170-7. [http://dx.doi.org/10.1002/jbt.21775] [PMID: 26537863] , 7Koch BJ, Hungate BA, Price LB. Food-animal production and the spread of antibiotic resistance: The role of ecology. Front Ecol Environ 2017; 15(6): 309-18. [http://dx.doi.org/10.1002/fee.1505] ]. A routinely exposure to antibiotics induce a selection for resistant bacteria that can persist on meat and in animal waste with a vertical transmission through maternal generations of breeding stocks [7Koch BJ, Hungate BA, Price LB. Food-animal production and the spread of antibiotic resistance: The role of ecology. Front Ecol Environ 2017; 15(6): 309-18. [http://dx.doi.org/10.1002/fee.1505] ]. Such bacteria can get in contact with humans in food-animal production facilities, in meat processing plants but also consuming contaminated meat [6Di Cerbo A, Palatucci AT, Rubino V, et al. Toxicological implications and inflammatory response in human lymphocytes challenged with oxytetracycline. J Biochem Mol Toxicol 2016; 30(4): 170-7. [http://dx.doi.org/10.1002/jbt.21775] [PMID: 26537863] , 8Mazzeranghi F, Zanotti C, Di Cerbo A, et al. Clinical efficacy of nutraceutical diet for cats with clinical signs of cutaneus adverse food reaction (CAFR). Pol J Vet Sci 2017; 20(2): 269-76. [http://dx.doi.org/10.1515/pjvs-2017-0032] [PMID: 28865210] -10Di Cerbo A, Sechi S, Canello S, et al. Preliminary study of antibiotic residues-related adverse food reactions in dogs fed on commercially available pet food. Vet Ital 2018.]. Despite there is not a common consensus on the use potential antibiotic resistance elicited by antibiotic used in animal food many countries have made substantial efforts to reduce the overall use of antibiotics in food-producing animals, in the attempt to decrease the antibiotic resistance in animals, the environment, and in human beings. Moreover, Mueller et al. hypothesized that food allergens e.g. beef, fish and chicken could drag antibiotics and hormones thus representing the cause for the onset of dermatological symptoms in cats [11Mueller RS, Olivry T, Prélaud P. Critically appraised topic on adverse food reactions of companion animals (2): Common food allergen sources in dogs and cats. BMC Vet Res 2016; 12: 9. [http://dx.doi.org/10.1186/s12917-016-0633-8] [PMID: 26753610] ]. Among pharmacologically active substances, tetracyclines (in particular oxytetracycline, OTC) and their metabolites present in meats and meat-based foods for humans and pets were considered and studied [9Di Cerbo A, Canello S, Guidetti G, Laurino C, Palmieri B. Unusual antibiotic presence in gym trained subjects with food intolerance; a case report. Nutr Hosp 2014; 30(2): 395-8. [PMID: 25208795] , 10Di Cerbo A, Sechi S, Canello S, et al. Preliminary study of antibiotic residues-related adverse food reactions in dogs fed on commercially available pet food. Vet Ital 2018., 12Chi Z, Liu R, You H, Ma S, Cui H, Zhang Q. Probing the in vitro cytotoxicity of the veterinary drug oxytetracycline. PLoS One 2014; 9(7): e102334. 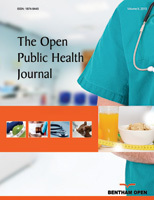 [http://dx.doi.org/10.1371/journal.pone.0102334] [PMID: 25019386] ]. We firstly hypothesized and observed the role of OTC as an underlying cause of some chronic inflammatory pathologies in vivo and in vitro as described by Di Cerbo et al. [8Mazzeranghi F, Zanotti C, Di Cerbo A, et al. Clinical efficacy of nutraceutical diet for cats with clinical signs of cutaneus adverse food reaction (CAFR). Pol J Vet Sci 2017; 20(2): 269-76. [http://dx.doi.org/10.1515/pjvs-2017-0032] [PMID: 28865210] , 9Di Cerbo A, Canello S, Guidetti G, Laurino C, Palmieri B. Unusual antibiotic presence in gym trained subjects with food intolerance; a case report. Nutr Hosp 2014; 30(2): 395-8. [PMID: 25208795] , 13Di Cerbo A, Centenaro S, Beribè F, et al. Clinical evaluation of an antiinflammatory and antioxidant diet effect in 30 dogs affected by chronic otitis externa: preliminary results. Vet Res Commun 2016; 40(1): 29-38. [http://dx.doi.org/10.1007/s11259-015-9651-4] [PMID: 26743397] -17Di Cerbo A, Canello S, Guidetti G, et al. Adverse food reactions in dogs due to antibiotic residues in pet food: a preliminary study. Vet Ital In press[http://dx.doi.org/10.12834/VetIt.1357.7466.2] [PMID: 29633230] ]. Due to its low cost and high efficacy [18Chopra I, Roberts M. Tetracycline antibiotics: Mode of action, applications, molecular biology, and epidemiology of bacterial resistance. Microbiol Mol Biol Rev 2001; 65(2): 232-60. [second page, table of contents.]. [http://dx.doi.org/10.1128/MMBR.65.2.232-260.2001] [PMID: 11381101] ], OTC is widely employed in the intensive farming of poultry [2Palmieri B, Di Cerbo A, Laurino C. Antibiotic treatments in zootechnology and effects induced on the food chain of domestic species and, comparatively, the human specie. Nutr Hosp 2014; 29(6): 1427-33. [PMID: 24972484] ], livestock [19Kimera ZI, Mdegela RH, Mhaiki CJ, et al. Determination of oxytetracycline residues in cattle meat marketed in the Kilosa district, Tanzania. Onderstepoort J Vet Res 2015; 82(1): 911. [http://dx.doi.org/10.4102/ojvr.v82i1.911] [PMID: 26842366] ] and aquaculture [20Chuah LO, Effarizah ME, Goni AM, Rusul G. Antibiotic application and emergence of multiple antibiotic resistance (MAR) in global catfish aquaculture. Curr Environ Health Rep 2016; 3(2): 118-27. [http://dx.doi.org/10.1007/s40572-016-0091-2] [PMID: 27038482] ]. However, OTC has a high affinity for calcium, mainly present within bones, and a very low and long clearance in treated animals [21Odore R, De Marco M, Gasco L, et al. Cytotoxic effects of oxytetracycline residues in the bones of broiler chickens following therapeutic oral administration of a water formulation. Poult Sci 2015; 94(8): 1979-85. [http://dx.doi.org/10.3382/ps/pev141] [PMID: 26015592] ]. Further, pet food production, which mainly relies on poultry by-products [22Maine IR, Atterbury R, Chang KC. Investigation into the animal species contents of popular wet pet foods. Acta Vet Scand 2015; 57: 7. [http://dx.doi.org/10.1186/s13028-015-0097-z] [PMID: 25886611] ], also avails itself of an important percentage of bone meal (20-30%) [8Mazzeranghi F, Zanotti C, Di Cerbo A, et al. Clinical efficacy of nutraceutical diet for cats with clinical signs of cutaneus adverse food reaction (CAFR). Pol J Vet Sci 2017; 20(2): 269-76. [http://dx.doi.org/10.1515/pjvs-2017-0032] [PMID: 28865210] ] with a consequent dragging of OTC residues that are frequently found within commercially available diets [10Di Cerbo A, Sechi S, Canello S, et al. Preliminary study of antibiotic residues-related adverse food reactions in dogs fed on commercially available pet food. Vet Ital 2018.]. Despite the setting of maximum residue limits in foods by Food and Drug Administration [23 Headquarters FaAOF. Maximum Residue Limits for Veterinary Drugs in Foods. . 2012. In: Codex Alimentarius Commission 35th Session [Internet]. ftp://ftp.fao.org/codex/weblinks/MRL2_e_2012.pdf.;[1-40].] and World Health Organization [24Agency UEP. Food and Drugs 2014. Available from: http://www.ecfr.gov/] OTC residues may still persist since bone is not considered as an edible tissue, thus making commercial pet food potentially harmful [25 Agency UEP. Food and Drugs. PART 556 -Tolerances for residues of new animal drugs in food. Subpart B-Specific Tolerances for Residues of New Animal Drugs. 2014. In: Electronic code of federal regulations (eCFR) [Internet]. Available from: http://www.ecfr.gov/]. In this paper, based on our previous results [6Di Cerbo A, Palatucci AT, Rubino V, et al. Toxicological implications and inflammatory response in human lymphocytes challenged with oxytetracycline. J Biochem Mol Toxicol 2016; 30(4): 170-7. [http://dx.doi.org/10.1002/jbt.21775] [PMID: 26537863] , 21Odore R, De Marco M, Gasco L, et al. Cytotoxic effects of oxytetracycline residues in the bones of broiler chickens following therapeutic oral administration of a water formulation. Poult Sci 2015; 94(8): 1979-85. [http://dx.doi.org/10.3382/ps/pev141] [PMID: 26015592] ], we aimed our research to determine possible interactions between biological substrates, such as proteins, and OTC, which might lead to an increased or decreased toxic effect on K562 cells mediated by the antibiotic. For this purpose we evaluated the potential toxicity of bone extract derived from OTC-treated chickens according to standard withdrawal times and from untreated chickens. K562 myelogenous leukemia cell line, were purchased from American Type Culture Collection (ATCC) (LGC Standards srl, Milan, Italy). K562 cells were grown in RPMI supplemented with 10% Fetal Bovine Serum (FBS) 100 g/mL streptomycin, 100 U/mL penicillin, 2 mM glutamine (Euroclone Spa, Milan, Italy). The cells were cultured in a humidified incubator at 37 °C with 95% and 5% CO2. Conditioned Culture Medium (CCM) was obtained by incubating 10 mL of a RPMI 1640 cell culture medium with 124, 90, 6, 2.48 mg and 124 μg of sterilized ground bone from chickens reared in the presence (OTC-CCM) or absence (BIO-CCM) of treatments with OTC and constantly shaken for 24-48-72 h at 37° C. After incubation, both CCMs were filtered through 0.45 and 0.20 μm syringe filters (Sartorius Stedim Biotech, Goettingen, Germany) to remove any residual ground bone particles and microbial [21Odore R, De Marco M, Gasco L, et al. Cytotoxic effects of oxytetracycline residues in the bones of broiler chickens following therapeutic oral administration of a water formulation. Poult Sci 2015; 94(8): 1979-85. [http://dx.doi.org/10.3382/ps/pev141] [PMID: 26015592] ]. Cell viability was assessed after 24-48-72 h of continuous exposure with the aforementioned concentrations. A Cell Counting Kit-8 (CCK-8) assay (Dojindo Laboratories, Kumamoto, Japan) was used to measure the cytotoxicity on K562 cells. Briefly, the K562 cells were plated on 96-well plates (Euroclone, Milan, Italy) at concentration of 5000 or 10000 cells/cm2. After exposure to desired concentrations of the different compounds, 10µl of CCK-solution was added to each well and incubated for a period of 2 h at 37°C. Finally, absorption was measured at 450 nm using a multiplate reader Multiscan FC (Thermo Scientific, USA). Dimethyl Sulfoxide (DMSO) 3% was used as toxic reference drug. Cell viability was expressed as a percentage of that of the untreated cells (Control). For each concentration of tested compounds, mean values of the mean absorbance rates from four wells were calculated. 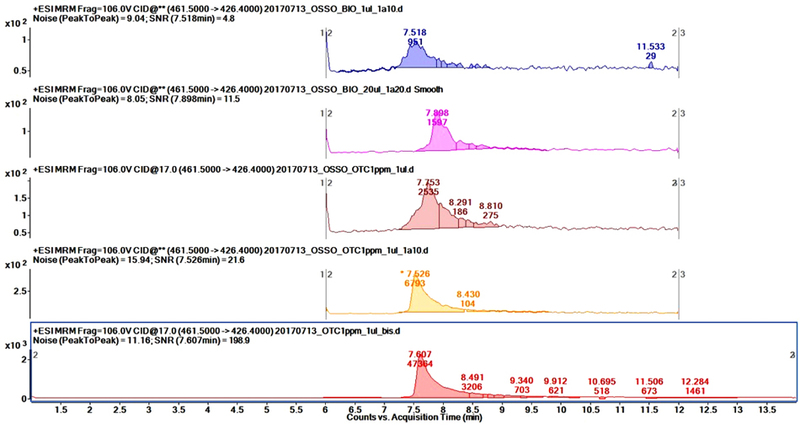 CCM samples were analyzed using a HPLC-ESI/MS, analyses were performed on a 1200 Series HPLC coupled to either a 6520A Quadrupole/Time-of-Flight high mass spectrometer (QqToF) or a 6410B Triple Quadrupole mass spectrometer (QqQ), (both from Agilent Technologies, California, USA) via an electrospray ion source (ESI). On the HPLC-ESI/QqToF system, the chromatographic separation was carried out with 4 mL injection volume on an Agilent Zorbax SB-C18 30 x 2.1 mm ID 3.5 mm ps column. Elution was performed at T=25°C, with a flow rate of 0.3 mL/min. were used as a mobile phase. A linear gradient elution starting at 0.5 min going from 2% (B) up to 40% (B) in 11 minutes then up to 95% (B) in 6 minutes was performed using water with 0.5% formic acid (A) and Acetonitrile (B) as mobile phase components. The mass spectrometer was operated in positive-ion mode (ESI+) using “Auto MS/MS” acquisition with MS and MS/MS scan ranges being 50<m/z<1000 Th and selection of the top 3 most abundant mono-charged ions from each MS scan for their subsequent MS/MS spectra acquisition (active exclusion was enabled after 1 spectrum and released after 0.15 min). 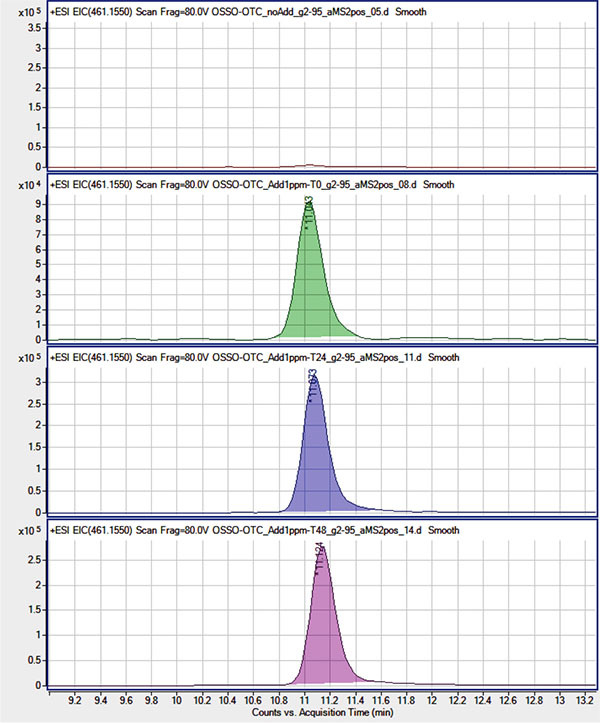 Targeted MS/MS analyses on the HPLC-ESI/QqQ included chromatographic separation on an Agilent Zorbax SB-C18 30 x 2.1 mm ID 3.5 mm ps column at 0.3 ml/min with the following gradient (mobile phases: A: water + 0.1 FA%, B: acetonitrile + 0.1 FA%): 0’ 98:2 A:B, kept for 0.5’ then B% was raised to 40% in 11’, then B% was raised to 95% in 3’, hold for 6’ then columns was reconditioned at the starting conditions, for a total runtime of 32 minutes. ESI source was operated in positive mode at 3.5 KV, the Gas Heater was set to 300°C, the gas flow was 8 l/min and the nebulizer pressure was set to 25 psi. Three transitions for OTC were chosen for Selected Reaction Monitoring, as shown in the Table (1). Selected Reaction Monitoring for the three transitions of OTC. A matrix-matched calibration curve was prepared, ranging from 1 ppb to 1 ppm OTC concentration on a diluted and filtered CCM; samples were filtered, diluted at the same dilution factor of the calibration curve and analyzed. For standard-addition method, the sample was spiked with OTC ranging from 1 ppb to 1 ppm. All data are presented as the mean ± SD of at least three different experiments done in quadruplicate. One-way ANOVA analysis of variance with Dunnett’s post-test, were performed to compare differences between the groups, as indicated in the figures (Graph-Pad 6 Software Inc., San Diego, CA, USA). P values < 0.05 were considered significant. Here we found that OTC-CCM resulted significantly cytotoxic at every incubation time regardless of the bone concentration while BIO-CCM resulted significantly cytotoxic only after 72h of incubation Fig. (1 ). Qualitative analysis was performed using the HPLC-ESI/QqToF assay in order to test for the presence of OTC (at a concentration ≥ 1mg/mL) and its main derivatives N-Demethyloxytetracycline, N-Didemethyloxytetracycline, and Apooxytetracycline. To this purpose, their presence was tested using their molecular ion signals eventually revealed on their respective Extracted Ion Chromatogram (EIC) in the ESI(+) MS experiments. Due to the QqToF high resolution and mass accuracy (< 5 ppm) each EIC was obtained using a narrow extraction window (10 ppm) centered on the molecular ion theorical m/z value. In order to account for the eventual suppression of OTC signals at the 1 mg/mL concentration level, due to matrix effect in extracted samples or for its degradation/combination in the extracted sample environment, extracted samples were as well spiked with OTC at 1 μg/mL and analyzed right away (t0) and after 24 and 48 hours (t 24, t 48). Neither OTC nor its derivatives were revealed in non-spiked OTC-CCM and BIO-CCM extracted samples Figs. (2 , 3 ) while OTC molecular ion ([M+H]+ at m/z= 461.155) was clearly revealed in t 0, t 24 and t 48 spiked samples with roughly the same signal intensity (within the instrument variability). This suggested the OTC concentration being substantially below the tested 1 μg/mL level, while reasonably excluding strong degradation/combination reactions of OTC in the extracted matrix environment at least within the tested 48 hours period. Graphical representation of the effects of conditioned medium with bone with (OTC-CCM) and without (BIO-CCM) oxyteracycline on K562 cell line at different incubation times (24, 48 and 72h) and at different bone concentrations (124, 90, 6, 2.48 mg and 124 μg). *p < 0.05, ***p < 0.001 vs Control (Ctrl). Targeted MS/MS analyses were performed on the HPLC-ESI/QqQ to quantitate OTC in bone samples. Preliminary tests showed a heavy matrix effect, thus we optimized the dilution factor and injection volumes for best results, ending up with a 20-fold dilution and 20 μl of diluted sample injected. 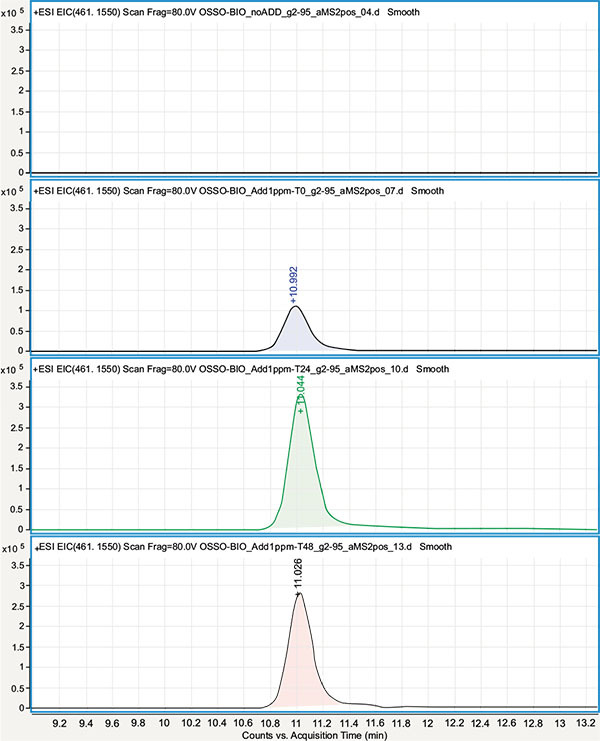 From top, ESI(+) MS EIC of m/z 461.155 ion shown in the retention window of OTC in OSSO BIO non-spiked, t0, t24 and t48 samples. From the top, ESI(+) MS EIC of m/z 461.155 ion shown in the retention window of bone with OTC non-spiked at 0, 24 and 48h. Matrix-matched calibration curve showed a good fit (r2 ≥ 0.999); unfortunately, the sample signal was below the quantification limit. In order to increase the sensitivity because of the low concentration of OTC in analyzed samples, standard-addition method was applied. In this case, by extrapolating the intercept of the curve on the y-axis we were able to determine OTC concentration. By correcting the value for the dilution factor, the final determined concentration was 200 ng/ml. As a proof of concept, we ran the same standard addition analysis on the organic bone extract; the curve in this case showed an intercept with the y-axis significantly closer to the origin, indicating that the concentration of OTC (if any) was significantly lower in this extract compared to the bone extract Fig. (4 ). Triple Quadrupole mass spectrometer (QqQ-ESI) molecular iron determination of OTC-protein complex. Previously published data showed a significant cytotoxic effect of OTC powder at 24, 48 and 72h at a concentration of 150 μg/mL (according to the amount of OTC expected to be provided to chicken during a standard treatment and disclosed on the antibiotic package) and at 48 and 72h at 75 and 35 μg/mL [8Mazzeranghi F, Zanotti C, Di Cerbo A, et al. Clinical efficacy of nutraceutical diet for cats with clinical signs of cutaneus adverse food reaction (CAFR). Pol J Vet Sci 2017; 20(2): 269-76. [http://dx.doi.org/10.1515/pjvs-2017-0032] [PMID: 28865210] ]. Moreover, the cytotoxic effect was clearly visible at OTC concentrations far below those previously investigated [10Di Cerbo A, Sechi S, Canello S, et al. Preliminary study of antibiotic residues-related adverse food reactions in dogs fed on commercially available pet food. Vet Ital 2018.]. We recently claimed the unavoidable occurrence of oxytetracycline as a contaminant of meat, bone meal and poultry by-products, which are widely present within commercially available pet diets and human foods (mainly würstels and sausages) [8Mazzeranghi F, Zanotti C, Di Cerbo A, et al. Clinical efficacy of nutraceutical diet for cats with clinical signs of cutaneus adverse food reaction (CAFR). Pol J Vet Sci 2017; 20(2): 269-76. [http://dx.doi.org/10.1515/pjvs-2017-0032] [PMID: 28865210] , 10Di Cerbo A, Sechi S, Canello S, et al. Preliminary study of antibiotic residues-related adverse food reactions in dogs fed on commercially available pet food. Vet Ital 2018.]. In addition, we reported a discrepancy among OTC kibble concentration, OTC serum concentration of dogs with dermatitis and otitis, diarrhea and general anxiety and in vitro OTC, 20% liquid or powder, last cytotoxic concentration [10Di Cerbo A, Sechi S, Canello S, et al. Preliminary study of antibiotic residues-related adverse food reactions in dogs fed on commercially available pet food. Vet Ital 2018.]. In fact, OTC kibble concentration was 19 μg/mL, serum oxytetracycline concentration was 0.22 μg/mL while in vitro last cytotoxic concentration was 35 μg/mL for the OTC powder and 87.5 μg/mL for the 20% liquid OTC. This latter result helped us to rule out the toxic role of OTC itself and allowed us to speculate the presence of a protein complex inside bone with OTC able to exert a cytotoxic and pro-inflammatory effect once released in the medium after 24-48h of incubation. Moreover, it is reasonable to hypothesize that most of symptoms observed in the dogs of our previous paper might be due to an overall inflammatory condition elicited by the daily intake of kibbles made of chicken-derived bone with OTC. Although more researches are needed in order to figure out the chemical composition of the complex and the molecular mechanism involved in the cell toxicity, our results revealed a new possible explanation linked to the side effects of chicken-derived bone with OTC. Our research represents a further insight into the overall landscape of antimicrobials abuse pointing out the possible consequences on pets and humans well being with particular regard to the actual antibiotic resistance spread. Unfortunately, WHO and FDA have set high OTC minimal residual limits within organs of farmed animals and do not consider bone as a possible veihicle of contamination since considered as not edible [8Mazzeranghi F, Zanotti C, Di Cerbo A, et al. Clinical efficacy of nutraceutical diet for cats with clinical signs of cutaneus adverse food reaction (CAFR). Pol J Vet Sci 2017; 20(2): 269-76. [http://dx.doi.org/10.1515/pjvs-2017-0032] [PMID: 28865210] , 26Graham F, Paradis L, Bégin P, Paradis J, Babin Y, Des Roches A. Risk of allergic reaction and sensitization to antibiotics in foods. Ann Allergy Asthma Immunol 2014; 113(3): 329-30. [http://dx.doi.org/10.1016/j.anai.2014.06.029] [PMID: 25168224] ]. In this view our findings rise new questions concerning the interactions between antibiotics, i.e. OTC, and organic substrates. Indeed our results pointed out the formation of a complex which induce cell toxicity even more then antibiotic alone. The further question to be answerd is wether this complex is able to induce antibiotic resitence too. Since WHO ruled out an agenda on the study and the prevention of antimcorobial resistence (AMR) in the different fields where the antibiotic were used, further studies with more detailed evaluations are needed to support our preliminary observations, and to confirm a possible new scenario in the AMR. Di Cerbo A, Sechi S, Canello S, et al. Preliminary study of antibiotic residues-related adverse food reactions in dogs fed on commercially available pet food. Vet Ital 2018. Di Cerbo A, Palmieri B, Chiavolelli F, Guidetti G, Canello S. Functional foods in pets and humans. Int J Appl Res Vet Med 2014; 12(3): 192-9. Di Cerbo A, Sechi S, Canello S, Guidetti G, Fiore F, Cocco R. Behavioral disturbances: An innovative approach to monitor the modulatory effects of a nutraceutical diet. J Vis Exp 2017(119). Headquarters FaAOF. Maximum Residue Limits for Veterinary Drugs in Foods. . 2012. In: Codex Alimentarius Commission 35th Session [Internet]. ftp://ftp.fao.org/codex/weblinks/MRL2_e_2012.pdf. ;[1-40].